Nature teaches by setting valuable examples. It exhibits wisdom in action. If we learn to observe nature, we can be a witness to its teachings, gaining in unimaginable ways. But to learn anything, one must be teachable. And to be teachable, one must be humble enough to know that one does not know. When one recognises that one does not know and is willing to be taught, this very simplicity helps one to be on the right track. The best way to learn from nature is to arrive in its presence completely empty. Come with an empty mind. An empty bowl can only be filled. Isn’t it? In the same way, only an empty mind that is surrendered in honesty, can gain the wisdom that the earth imparts. A baby in mother’s womb purely surrenders to the process of its development. The newborn doesn’t interfere. Only by being present innocently, nature works for the newborn’s best interest. A tree is an inspiring symbol being empowered. A tree reaches it’s absolute potential only by surrendering to the innate intelligence of nature. Right from the beginning when a seed is planted into the earth until the end when the tree stands tall in its complete glory, the natural intelligence supports its growth. In the most powerful way the tree is supported moment to moment. A tree is powerfully rooted. It holds Mother Earth intrinsically. It holds on to the wisdom and innate intelligence of mother nature. The tree’s roots are grounded in nature’s intelligence. This very grounded-ness helps the tree to grow and rise up through its trunk. It spreads wide expressing through various branches. It strongly exhibits its unique qualities. Expressing itself through unique leaves, flowers and fruits. Nature knows what’s best for you. Only when we are willing to learn, unlearn, relearn can we express our finest selves. Every seed has a different potential. A mango seed can never turn into a banana tree. Every seed get’s the best environment to grow for it to become its unique best. 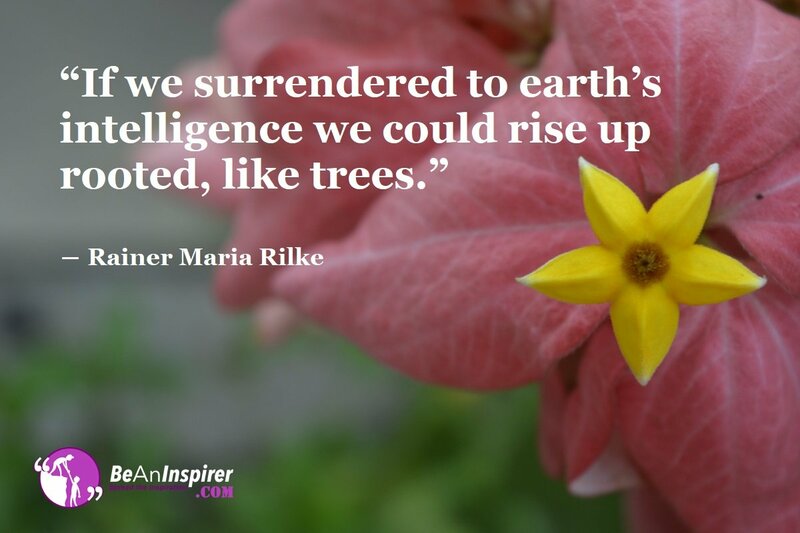 When we humble ourselves and surrender to nature, we accept nature’s inherent intelligence. Knowing exactly what could be best for us, nature reveals to us those valuable lessons. When we follow its teachings, we turn into the best versions of ourselves. We then gain the ability to contribute more. Ready To Learn, Unlearn, Relearn? Share with us, how do you relate to nature? Do you spend time in nature? Let us know in the comment section below. Let’s continue this inspiring conversation with each other.